them first in boiling water for a moment to reduce their strong taste a little bit. mix it with tenpura batter and deep fry it. Japanese grocery stores that exist in most large European and American cities. depends on the size of the bowl in which you will serve the noodles). 2. Cut naruto (about 7mm thin) and leek/green onion. 3. Put Udon into sieve and rinse it with hot water. "Ninben Tsuyu no moto" sauce the proportion sauce-water is 1:8. 6. 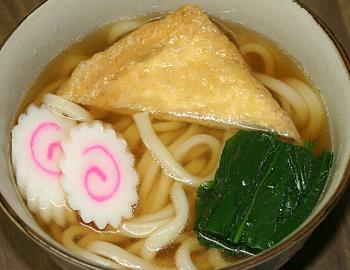 Decorate Udon with atsuage, cut leek and naruto. 7. Put the deep fried pieces (Rests of Tenpura deep frying), naruto and cut leek onto the noodles. 8. Put the york, cut leek and naruto onto the noodles.